Whenever there are significant events that take place, particularly those with some historical context, I like to take a step back and, if possible, go back in time and find real-time sources to generate a better understanding of what people were thinking at the time. The terrible events in Charlottesville was a catalyst for me to take this approach. 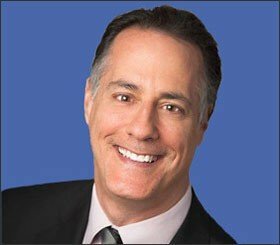 I also find that emotions can be the greatest enemy for investors so when I see the nation in the grip of highly charged and emotional events, I try to use these situations as opportunities for me to train myself to see if I can keep my wits about me and to dig a little more below the surface for answers to questions that I have. The Charlottesville protests, violence, and murder, along with the removal of statues of Confederate symbols in many cities triggered a curiosity in me as to why these statues were erected in the first place. They have obviously triggered a lot of intense reactions from those who despise what they believe them to stand for in terms of slavery and oppression and for those who believe they are an integral part of our nation’s history and symbolic of a time and era that generated immense pride among southerners for their culture and way of life. Rather than overlaying my biases onto the situation, I wanted to go back in time and see what people were thinking in the moment when considering erecting Confederate statues. Whenever I want to immerse myself into an event real time I turn to one place and one place only and that is www.newspaperarchive.com. My mission was to see if I could find any real time articles during the time when the public was debating the merits of erecting such statues. 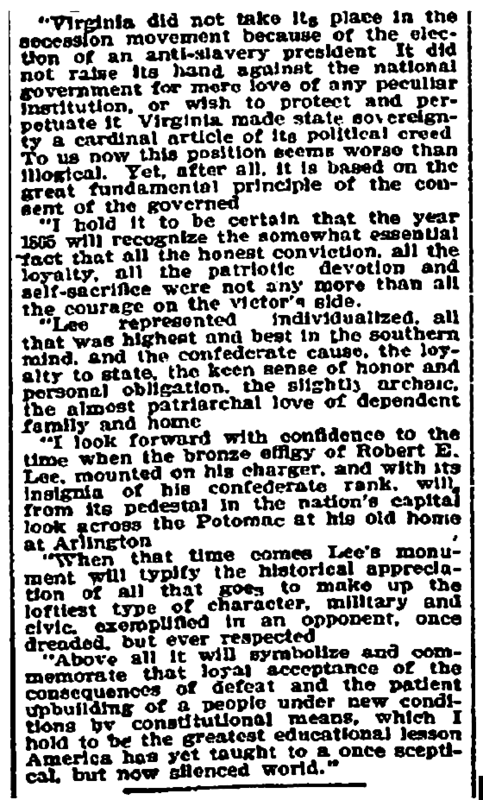 I did a search between 1900 and 1916 on the phrase “Robert E Lee statue” and found some interesting results mostly between 1908 and 1910 related to a proposal to erect a statue to Lee in Washington D.C. at Statuary Hall. Each state was given the opportunity to have two statues placed in the hall of two people they think best represented their state. Virginia naturally chose George Washington and, although the home to Thomas Jefferson and John Marshall, selected Robert E. Lee for the second statue. 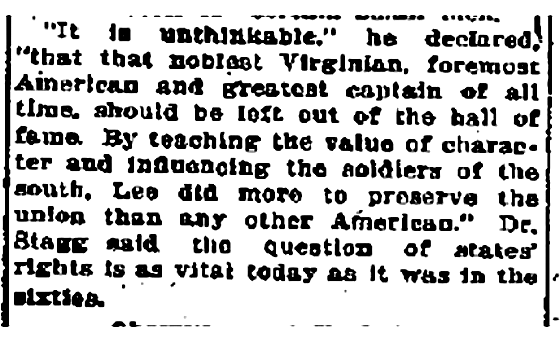 The Virginians knew the selection of Lee would be controversial so they required the acceptance to be a package deal. In order to get Washington, you had to approve Lee. 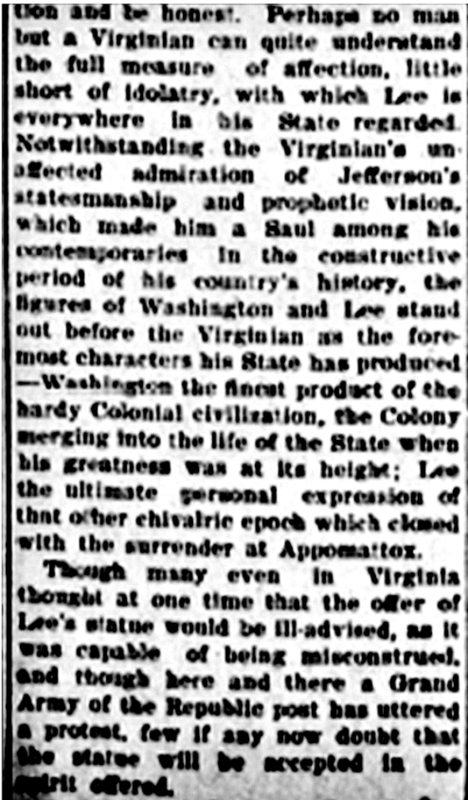 The New York Times attempted to give a dispassionate description of the issue and why Virginians felt so strongly about Lee being included with George Washington. The full article is reprinted below while the most interesting part is what I excerpt below it. The articles are worth reading in their entirety so I suggest cutting and pasting it into Word if you can’t make them more legible here. One of the themes that keep coming up in my research is that Lee represented chivalry and graciousness in defeat and a man who fought for what he believed in but once defeated he accepted the outcome. This is particularly emphasized in the next clipping. This next article is focused on a speech given to students at the University of Chicago in 1902. The speaker points out the change in attitude that England had towards Oliver Cromwell and asks whether the same will apply to Robert E. Lee and if he will end up having a statue erected for him. He discusses some of the justifications as to why he might deserve one. Interestingly, the presenter is from Boston. Assuming he was not a transplant from the south then this was a Yankee talking. tears that were given for a cause they truly believed in and they did not want their sacrifice to have been in vain. 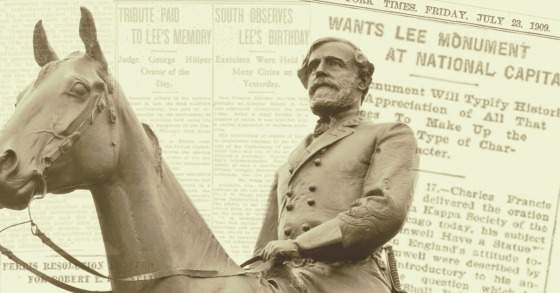 The statue was a reminder of the sacrifice and the nobility they perceived that Lee stood for. I cannot reiterate enough how important it is to try to understand what was happening at the time these decisions were made and to not solely look at them from the lens of today. This is not to dismiss how deeply offended and hurt people may be by them, particularly in the African American community, as this is completely justified. Rather, I am personally fascinated with trying to figure out how we got to the point where these statues were put up, particularly when history suggests it’s the victors that control the narrative. The excerpt points out the importance of trying to see things that took place-based on what was happening at the time versus with the benefit of 20/20 hindsight. The speaker points out that Virginia’s decision to secede at the time was not based on slavery but predicated on state’s rights which he now says “seems worse than illogical.” It’s quite understandable how one can be deeply offended by these statues and monuments but when they were debated and approved the war was still relatively fresh as there were many Confederate veterans and citizens still alive who remembered the blood, sweat, and symbols to influence history. Perhaps it was the pragmatic realization that the south was not going to be changed overnight and they had tremendous pride in their long-established culture and way of life and this could not be erased if there was going to be any chance at healing the country. The union had to be maintained, the country healed, slavery abolished, and the tradeoff for these was that differences had to be recognized and accepted. While I appreciated the cool and rational approach taken by the New York Times and the University of Chicago speaker to explain the almost religious-like devotion among Virginians towards Lee at the time, I must say I was a bit dumbfounded by some of the justifications I read from some proponents of having Lee’s statue put in the hall. The first one was a Congressman from Oklahoma who proposed a resolution in the House to have the statue put in the hall. Once again I have reprinted the full article and resolution and then excerpted the completely ridiculous justification for it. 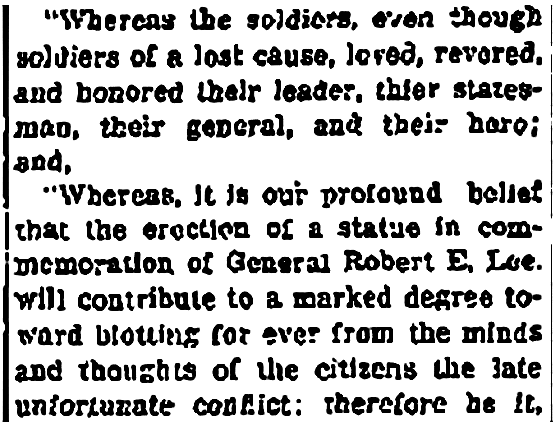 And how would erecting a statue to Lee “contribute to a marked degree toward blotting for[ever] from the minds and thoughts of the citizens the late unfortunate conflict”? It would seem like seeing the statue would be a continuous reminder of it. 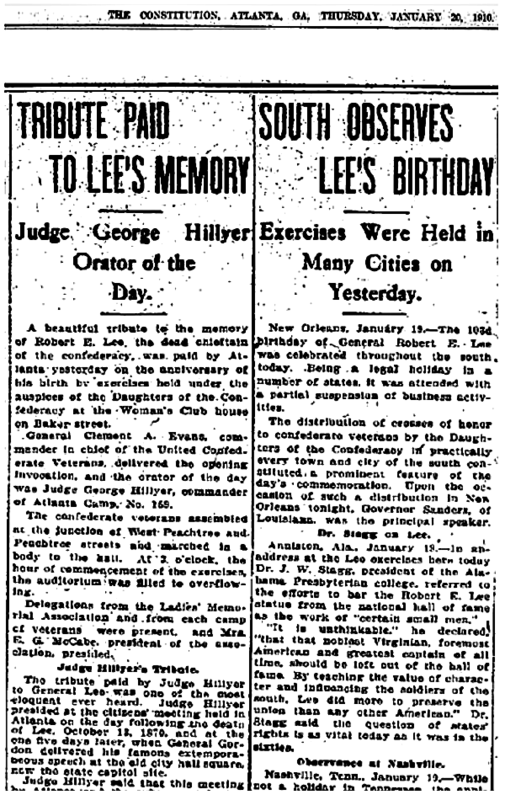 From the next articles, I was surprised to learn that Lee’s birthday was a holiday in a number of southern states. In addition to learning about Lee’s birthday being a holiday, I was also rather surprised to read the justification for having his statue in the hall. It sounds rather Trumpian. When I think of the Civil War and the goal of preserving the union the first person that comes to mind for me is Abraham Lincoln, not Robert E. Lee. According to the orator, however, “Lee did more to preserve the union than any other American.” Talk about seeing what you want to see and cognitive dissonance. It is amazing what our minds will do to distort reality to help us cope, survive, and rationalize our actions and those of others so that we do not have to face the life-altering possibility of having to change our minds and long-held beliefs. The more I study history and listen to people, the more I come to learn how powerful confirmation bias. People formulate opinions and beliefs and look for reasons to confirm them and discard evidence that could contradict them. Staying on the path of happy self-delusion is much less painful than going down the bumpy road of being open to changing one’s mind and actually doing it. Thank you for this article Gary. We Americans are all incredibly fortunate that it was Lincoln making the decisions during the civil war and not some of the other players present during this painful time in our history! I found this article interesting and want to thank you for sharing it. Great Article, thanks for taking the time to investigate this situation. I also think of Lee as more of a Southern tradition issue and someone the south could look up to after the war that divide the country so brutally, and not someone who was know for promoting slavery. He did have slaves at this time, most landowner of this time either had slaves or others who were paid a horrible wage to tend their crop and livestock. The National cemetery in Arlington VA was once property of Robert E Lee and before him, George Washington. From what I have read and heard about Lee and his family, he would want the statues down if it caused as much concern as its doing right now……….he wanted the country to be one again, and never would have joined the Confederate Army had his beloved VA not succeeded the Union. And as the articles you have here suggest, VA succeeded due to the state rights issue much, much more than the slave state issue. I have been told a direct descendant of Robert E Lee’s father, General Light Horse Harry Lee- One of General George Washington’s closest friends and comrades. It was he who coined the phrase- First in war, First in Peace, First in the hearts of his Countrymen, at Washington’s eulogy. Washington had no children of his own, Martha Custis has children from a previous marriage and Robert E Lee was married to one of the Custis girls. Gary, thank s for writing this, it game me time to think about the situation and reflect some old stories my Grandparents passed down to me…. well…Robert E Lee never owned a piece of real estate in his entire 63 years. The Arlington property was passed down in the Custis family. As you said, Lee married GWP Custis’ daughter. The enslaved people on the three Custis farms also belonged to that daughter.